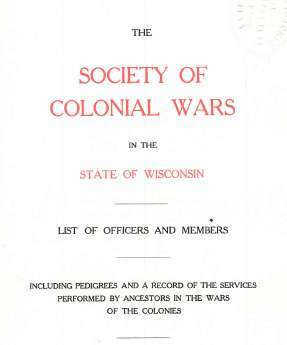 The book, "The Society of Colonial Wars in the State of Wisconsin; List of Officers and Members; Including Pedigrees and a Record of the Services Performed by Ancestors in the Wars of the Colonies," by The Society, Milwaukee, Wisconsin, 1906. 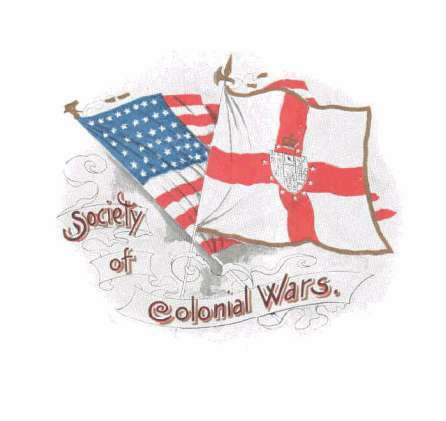 The book describes the genealogical descent (pedigree) of the society members from ancestors who served the colonial cause (wars) in the 1700's. 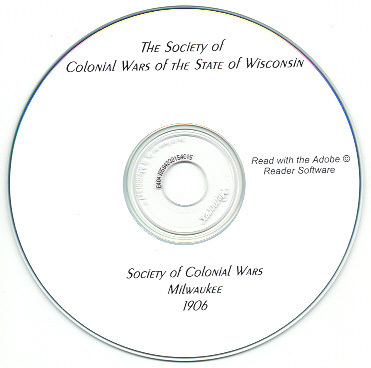 It is filled with genealogical information about various Wisconsin residents. The book has approximately 134 pages, and a fully linked Index of members. Please note: This is not a paper book, it is a scan of the original paper book into the digital Adobe PDF format, written on a CD-ROM. You read this book on your computer using the free Adobe Reader software. It is a digital version of a hard to find book. 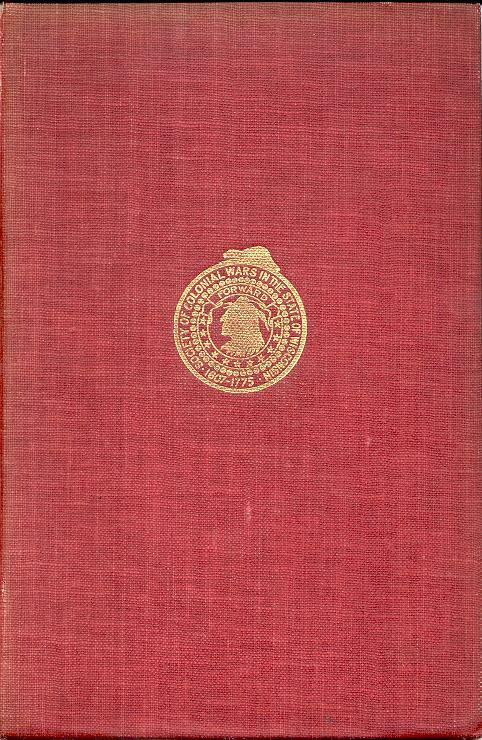 If you could find a copy of the 1906 printed book, it would be very expensive. Here are the male names found in the book, I did not transcribe the female spouse's names. Preserved Abell, Eleazer Adams, Henry Adams, William Adams, John	Alden, Matthew Allyn, John Appleton, Humphrey Atherton, Christopher Avery, James Avery, Russell Avery, Thomas Avery, & James Avery, Jr.
Lewis Baker, George I. Bancroft, L. H. Bancroft, Levi Horace Bancroft, Benjamin Barrett, Humphrey Barrett, James Barrett, John Bates, Horatio Nelson Baylies, Nicholas Baylies, James Beebe, Lemuel Beebe, Samuel Benedict, Thomas Benedict, Asa Bigelow, Ebenezer Bigelow, Frank Gordon Bigelow, Hopestill Bigelow, John Bigelow, Joshua Bigelow, Thomas Bigelow, William Bigelow, Robert Blood, Ichabod Boynton, John Boynton, William Bradford, Joseph L. Brent, Jonathan Brewster, William Brewster, Abner Brockway, Edward Payson Brockway, Picket Brockway, William Stevens Brockway, Charles Curtis Brown, Noah Brown, John Buell, Joseph Bulkeley, & Peter Bulkeley. Richard McCall Cadwalader, David Manning Camp, Hoel Hinman Camp, Robert Camp, Thomas Edward Camp, Abel Camp, Jr., Barlow Carpenter, Franklin Carpenter, Oliver Carpenter, Richard Carpenter, John Avery Gore Carson, Chandler B. Chapman, Chandler Pease Chapman, Johnson Chase, Timothy Cheney, John Chipman, Samuel Chipman, Isaac Choate, Jacob Choate, Joseph Clapp, Ezra Clark, John Clark, Nathaniel Clark, Orlando Elmer Clark, Paul Clark, Rufus Clark, William Clark, Daniel Clement, Nathaniel Clement, Edmund Coffin, James Coffin, Nathaniel Coffin, Paul Coffin, Peter Coffin, Tristram Coffin, William Coffin, William King Coffin, Daniel Colburn, Cadwallader Colden, Nathaniel Collins, Francis Cooke, Clewley Copeland, Smith Copeland, William Copeland, Thaddeus Crane, Francis James Crosby, Frederic Crosby, Henry Alvin Crosby, Michael Crosby, Nathan Crosby, Oliver Crosby, Simon Crosby, & Philip Curtis. John Davenport, Daniel Davison, Daniel Denison, George Denison, Henry Denison, John Denison, Caleb Drury, Ebenezer Drury, John Drury, Thomas Drury, Zedekiah Drury, Richard T. Walker Duke, Jr., Corydon G. Dwight, Elihu Dwight, Henry Dwight, John Dwight, Nathaniel Dwight, Oliver Frederic Dwight, Samuel Dwight, Simeon Dwight, & Timothy Dwight. Theodore H. Eaton & Anthony Emery. Alpheus Farr, Asahel Hubbard Farr, Jonathan Farr, William Mattocks Farr, Henry Farwell, Joseph Farwell, Daniel Grant Fitch, Grant Fitch, Haynes Fitch, James Fitch, Thomas Fitch, William Grant Fitch, Alexander F. Fleet, Francis Gardiner Flint, Jennie L. Flint, John Flint, John Gardiner Flint, Jonas Flint, Thomas Flint, Wyman Flint, Wyman Kneeland Flint, Daniel Foote, Freeman Foote, Abraham Fowler, Caleb Fowler, Joshua Fowler, Constant Freeman, Edward Fuller, Henry Alexander Fuller, Matthew Fuller, & Oliver Clyde Fuller. John Gallop, David Gardiner, John Gardiner, Joseph Gardiner, Lion Gardiner, Zenas Gardner, Horatio Gates, Perez Dickinson Gates, Thomas Asa Gates, John M. Glidden, Nathan Gold, D. Linn Gooch, John Gorham, Nathaniel Gorham, Stephen Gorham, John Graves, Alfred William Gray, John Gray, Nathaniel A. Gray, Beriah Green, Barlow Greene, Howard Greene, John Greene, Peter Greene, Thomas Arnold Greene, Welcome Arnold Greene, Samuel Gridley, Thomas Gridley, & Timothy Gridley. Ezekiel Hale, John Hale, Robert Hale, Samuel Hall, George Harris, Gibson Harris, Thomas Hart, Moses Hartshorn, Enoch Dole Harvey, Ephraim Hathaway, John Hathaway, Anthony Hawkins, Gerry Whiting Hazelton, John Hazleton, William Hazleton, Nathaniel Hibbard, Zebulon Hibbard, Elijah Hildreth, Ephraim Hildreth, Israel Hildreth, James Hildreth, Richard Hildreth, Benjamin Hinman, Edward Hinman, John Hollister, Thomas Hollister, Bedford Brown Hopkins, Ichabod Hopkins, Otis Ransom Hopkins, Nehemiah Horton, Jonathan Howes, Thomas Howes, John Howland, Eleazer Hubbard, Joseph Hubbard, John Hurlbut, Rufus Hurlbut, Samuel Hurlbut, Stephen Hurlbut, Thomas Hurlbut, George Hussey, & Thomas Hyde. Daniel Jewett, Francis Jewett Johnson, John Johnson, Moses Johnson, Otis Russell Johnson, Samuel Johnson, Charles Louis Jones, Charles P. Jones, Oliver Jones, Abiathar Joy, David Joy, Jesse Joy, Joseph Joy, Nehemiah Horton Joy, Thomas Joy, James Judson, & Joseph Judson. 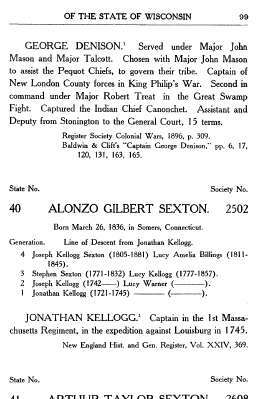 Clarence Kellogg, Harry Lafayette Kellogg, Jonathan Kellogg, Joseph Kellogg, La Fayette Kellogg, Rowland Kellogg, Stephen Kellogg, William Kellogg, George Kennan, Thomas Kennan, Thomas Lathrop Kennan, Benjamin Kneeland, David Kneeland, Edward Kneeland, Hezekiah Kneeland, Isaac Kneeland, James Kneeland, & Moses Kneeland. William Alexander La Motte, Horace Lampson, Daniel Lane, Isaac Lane, John Lane, Denison Lathrop, Israel Lathrop, Jedediah Lathrop, Samuel Lathrop, Bela Peck Learned, Daniel Lewis, David Lewis, James Lewis, James Lombard, John William Peterson Lombard, Lewis Lombard, Jonathan Low, Thomas Low, Elias Lyman, John Lyman, Moses Lyman, & Timothy Lyman. David Manning, Samuel Manning, Jonathan Marsh, William Marsh, Nathan Martin, Samuel Martin, Wait Martin, William Seaborn Martin, Elisha Marvin, Reinold Marvin, Barachias Mason, Ebenezer Mason, Johnson Mason, Thomas Mason, Timothy Battelle Mason, William Lyman Mason, Richard Mather, Timothy Mather, Emory McClintock, John McCloud, F. B. McCoy, Arthur Nye McGeoch, Peter McGeoch, Thomas McKnight, James Minott, Jacob Morgan, Abner Moseley, John Moseley, Joseph Moseley, Jacob Moulton, John Moulton, Jonathan Moulton, & Nathaniel Thayer Moulton. Benjamin Newberry, George Corlis Nightingale, Robert Noble, Asahel Hubbard Nye, & Elijah Nye. Daniel Paddock, Peter Paddock, Joseph Ruggles Paine, Moses Paine, Samuel Paine, Stephen Paine, Joshua Parmalee, Charles Lathrop Parsons, Amos Paul, Edward Joy Paul, George Howard Paul, James Paul, Henry Clay Payne, Orrin P. Payne, Samuel Payne, Ebenezer Pease, James Pease, George W. Peck, Jonathan Franklin Peirce, Jonathan Lovering Peirce, Edgar Pennoyer, Nelson Alonzo Pennoyer, Joseph Pepoon, John Perkins, Oliver H. Perry, Ralph Percy Perry, Abel Phelps, Benajah Phelps, Joseph Phelps, Timothy Phelps, William Phelps, Ephraim Pierson, Joseph Pierson, John Pike, Joseph Pike, Thomas Pike, Thomas Poitevin, Thomas Prentice, & John Price. Joseph J. Randolph, P. J. Randolph, Henry Reade, Philip Reade, William Reade, Joshua Ripley, Silvanus Ripley, Benjamin Russell Rogers, Horace Brewster Rogers, John Rowley, Moses Rowley, Charles Herman Ruggles, David Ruggles, George D. Ruggles, Charles Copeland Russell, Cyrus H. Russell, & Samuel Russell. Christopher Sargent, John Smith Sargent, Thomas Sargent, William Sargent, John Sevier, Alonzo Gilbert Sexton, Arthur Taylor Sexton, Joseph Kellogg Sexton, Kellogg Sexton, Paul Denison Sexton, Stephen Sexton, Edmond Sherman, Henry Sherman, Samuel Sherman, Michael Myers Shoemaker, Ebenezer Short, Henry Short, Matthew Short, Rouse Simmons, Samuel Sweet Simmons, Frank Slosson, Martin Slosson, Abel Timothy Smith, Abraham Smith, Benjamin Wilson Smith, John Keyzar Smith, Philip Smith, Samuel Smith, Samuel F. Smith, William Belinger Smith, William Stark Smith, Zerubbazel Snow, Arthur J. C. Sowden, Oliver Spaulding, Timothy Spaulding, Thomas Stanton, Aaron Stark, Abiel Stark, Charles Gager Stark, Jedediah Lathrop Stark, Joshua Stark, Benjamin Starr, Comfort Starr, Daniel Starr, Samuel Tallman Starr, William Starr, William James Starr, Albert Burt Stebbins, Albert Kellogg Stebbins, Edward Stebbins, John Stebbins, Joseph Stebbins, Lamar Stebbins, Lemuel Dibble Stebbins, Rowland Stebbins, Thomas Stebbins, George Stillman, John Stillman, J. Kennedy Stout, Asahel Strong, Elijah Gridley Strong, Elisha Strong, John Strong, William Barstow Strong, William James Henry Strong, William Sumner Strong, William Wolcott Strong, Walter Lispenard Suydam, Benjamin Swain, Chipman Swain, Jeremiah Swain, Joseph Swain, & William Chester Swain. Anson Hawley Taylor, Ephraim Terry, Samuel Terry, Nathaniel Thomas, William Thomas, John Thompson, Thomas Thompson, Spencer Roane Thorpe, John Tilley, Thomas Tracy, Richard Treat, Robert Treat, Samuel Treat, James Trowbridge, William Trowbridge, & Frank Trumbull. 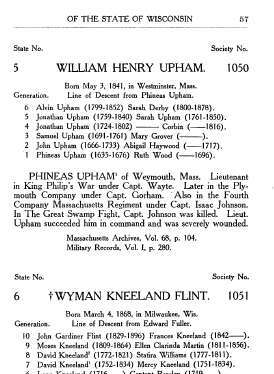 Harold Green Underwood, John De Loss Underwood, Alvin Upham, John Upham, Jonathan Upham, Phineas Upham, Samuel Upham, William Henry Upham, Ellis Baker Usher, & Isaac Lane Usher. Simeon Van Akin, Henry Van Dyke, & Richard Van Dyke. James Franklin Wade, Abel Walker, Caleb Walker, Ebenezer Walker, Thomas Waterman, Abraham Watrous, Joseph Watrous, Samuel Watrous, Cephas Weed, Thomas Welles, Andrew Shelton Wells, David Wells, JohnWells, Thomas Wells, Charles Wetherill, Charles Mayer Wetherill, Daniel Wetherill, Richard Benbridge Wetherill, Samuel Wetherill, Jacob Wheeler, Eleazer Wheelock, Ralph Wheelock, John B. White, Daniel Wicom, Richard Wicom, William Ward Wight, Simon Willard, Charles Williams, Thomas Williams, Benjamin Wilson, David Wilson, William Wilson, Roger Wolcott, Joseph Woodman, James Rutherford Wyly, & Oliver Cromwell Wyly.